Bracelet Buddy gives your customer an extra hand needed to fasten those awkward chains and clasps. Choose Silver Tone or Gold Tone. 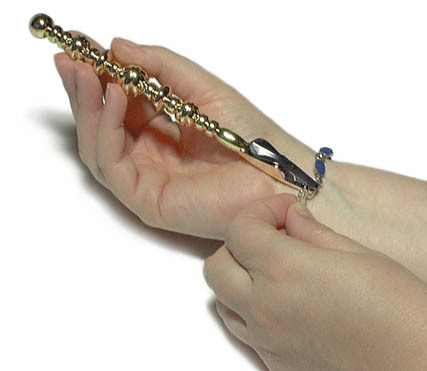 Gently holds one end of the bracelet while you fasten the clasp with your free hand. Silver or Gold Plated Polymer. 7" long. Price is suggested retail, keystone. Price listed is suggested retail and subject to change without notice. Available wholesale only to approved retailers. Call 1-800-487-0408 for current price.